SnapPlus is a nutrient management (NM) planning application, developed by scientists at University of Wisconsin-Madison, designed to assist farmers in the creation of NM plans and estimate phosphorus (P) loss in accordance with statewide agricultural performance standards and resource management policies. SnapPlus also incorporates the latest planning criteria and guidelines from the Wisconsin Natural Resources Conservation Service (NRCS) 590 conservation practice standard for NM, as well as University of Wisconsin nutrient application recommendations. SnapPlus generates annual and rotational average results for soil and P loss related to any cropping system or management practice that can be simulated in RUSLE2 and Wisconsin P Index equations. 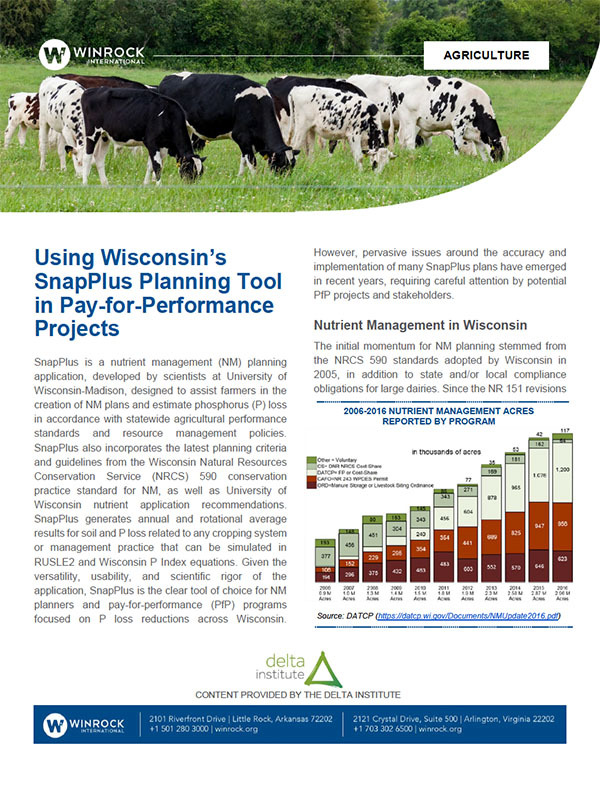 Given the versatility, usability, and scientific rigor of the application, SnapPlus is the clear tool of choice for NM planners and pay-for-performance (PfP) programs focused on P loss reductions across Wisconsin. However, pervasive issues around the accuracy and implementation of many SnapPlus plans have emerged in recent years, requiring careful attention by potential PfP projects and stakeholders.